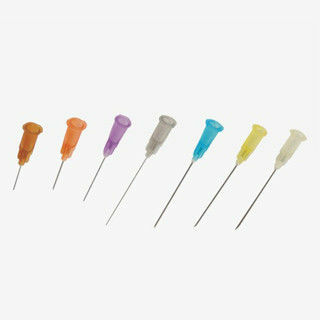 1)Hypodermic needle manufactured by automatic machine according to ISO 7864:1993 standard. 2)Sterilized by EO gas, sterile, non-toxic, non-pyrogenic ,single use only. 27G, 28G, 29G, 31G available. 5)larger inner diameter, high flow rate. 6)Needle bevel enables smooth, sharpness maximize, patient comfort. 7)Color coded hub by size for clear recognition. 8)Semi-transparent hub for clearness of flashback. 9)Needle hub: made of medical grade transparent PP. 10)Needle protector: made of high transparent medical grade transparent PP. 11)Lubricant :silicone oil ,medical grade. 13)Scope for use: for muscle injection ,infusion, dispensing drug . (subcutaneous, intradermal, intramuscular, intravenous ,oral, nasal or rhino injection).